Switches to fail-safe control when malfunction is detected in encoder signal that detects up/down speed and direction of door glass. Switches to fail-safe control when error beyond regulation value is detected between the fully closed position and the actual position of the glass. Pulse sensor malfunction When only one side of pulse signal is being detected for more than the specified value. Both pulse sensors malfunction When both pulse signals have not been detected for more than the specified value during glass open/close operation. 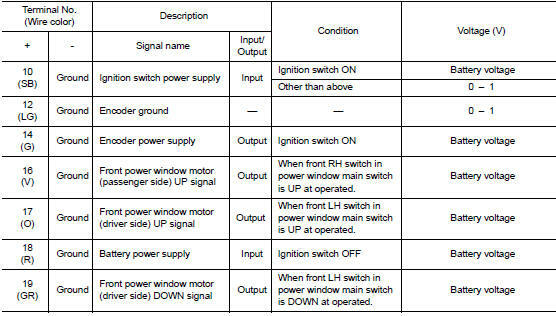 Pulse direction malfunction When the pulse signal that is detected during glass open/close operation detects the opposite condition of power window motor operating direction. 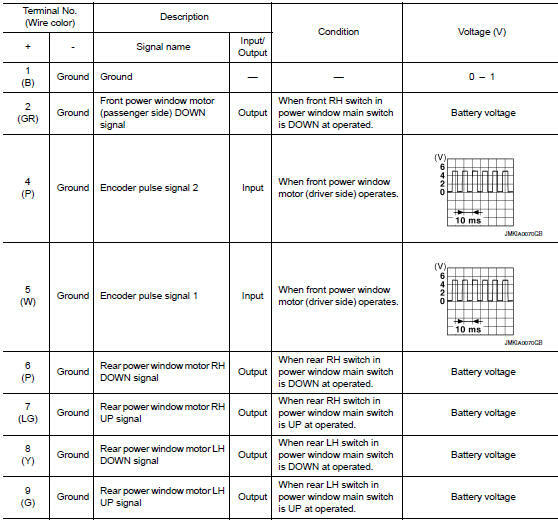 Glass recognition position malfunction 1 When it detects the error between glass fully closed position in power window switch memory and actual fully closed position during glass open/close operation is more than the specified value. Glass recognition position malfunction 2 When it detects pulse count more than the value of glass full stroke during glass open/close operation. It changes to condition before initialization and the following functions do not operate when switched to failsafe control. Perform initial operation to recover when switched to fail-safe mode. However, it switches back to fail-safe control when malfunction is found in power window main switch or front power window motor (driver side).